Equinor has signed agreements funding basic research in five Norwegian universities and NHH by NOK 315 million over five years. The biggest agreement was signed with NTNU in Trondheim on 1 February. “These agreements reflect the journey made by Equinor, from an oil and gas company to a broad energy company." says Anders Opedal, Equinor’s executive vice president, Technology, Projects and Drilling. 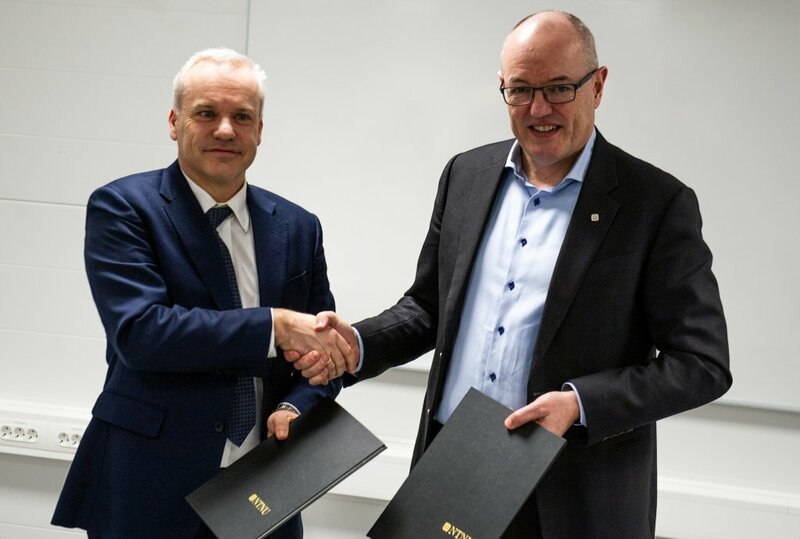 The agreement with the Norwegian University of Science and Technology (NTNU) is the sixth academic agreement on basic research signed by Equinor this winter with Norwegian universities. Bringing NTNU as much as NOK 19 million per year for five years it is also the biggest basic research agreement ever signed by Equinor with a university. The six agreements total NOK 63 million per year, i.e. NOK 315 million over five years from and including 2019. In addition to NTNU, agreements have been signed with the University of Oslo, the University of Bergen, the University of Stavanger, the University of Tromsø and the Norwegian School of Economics and Business Administration (NHH). “We have a long-term perspective on our business. Collaboration with leading academic communities in various fields is beneficial to us and society as a whole,” says Anders Opedal, Equinor’s executive vice president, Technology, Projects and Drilling. Slightly more than 20 percent associated with digitalisation and other topics, which are neither directly associated with the petroleum business, nor the green transition. “These agreements reflect the journey made by Equinor, from an oil and gas company to a broad energy company. We will produce oil and gas demanded by the world in a competitive way and with gradually lower greenhouse gas emissions. In addition, we will grow significantly within renewable energy,” says Opedal. The agreements are part of Equinor’s academic programme that has been running for ten years and funded a great number of positions, scholarships and educational initiatives at universities and colleges. “Providing access to clean energy for everyone is now a global challenge that will require even more collaboration between world-leading academic and business communities. As a university NTNU has set its own goals, but in this academic agreement with Equinor we can now see results that have consequences far beyond our own businesses and national borders,” says NTNU president Gunnar Bovim. Equinor has an annual research budget of NOK 2.8 billion, about half of which is spent externally. Most of the research funds are spent on contract research, i.e. research on known and defined issues. Through the academic agreements Equinor funds basic research. Basic research is essential to better understanding the world, developing researchers – and defining new issues to be further explored.